This is a chest in the form of a sarcophagus made in walnut with a prism-shaped lid -undivided inside and originally with a lock fixed from the inside- decorated on the outside with superimposed relieves, with a kettle-shaped base supported by carved feet in the form of lion´s paws, and a truncated-pyramid shaped lid with a carved convex moulding, articulated with three double-pointed eyebolts; the back panel is not decorated. It is interesting to point out its similarities, both in the shape and in the notched mouldings, with the ledges of the lids of a pair of chests kept in the Frick Collection in New York, although in these, the edges of the lids are carved. The box has a carved decoration -in low and high relief-and is partly gilded with lumegiature, which facilitate the distinction between the different aspects of the decoration. The composition delimitates and subtly compartmentalises the surfaces thanks to the four figures placed in the corners, to the central cartouche placed in the front panel and to the two friezes, top and bottom. The four high-relief figures in the corners represent prigioni, prisoners with Persian clothing, of grave and monumental aspect, made in a larger scale than the rest of the carved figures of the chest. Similar figures, which Alvar González-Palacios (Il Mobile in Liguria, Genoa, 1996) suggests derived from ancient Roman models, can be seen in the corners of many Roman chests and in the drawing attributed to the workshop of Perino del Vaga in the Witt collection (Courtauld Institute of Art in London). The front panel of the chest is divided into two sections by a cartouche in the shape of a "mirror" held by two putti, on which there are practically no traces left of the coat-of-arms that was once painted on it. On both sides are represented two scenes, crammed into little space, whose iconography is difficult to identify today due to the fact that these chests were usually made in pairs, and the subjects represented on them complemented each other. According to Feulner, they seem to allude to subjects relating to king Solomon, representing to the right a scene of a banquet with a sideboard in the background, and to the left possibly the visit of the queen of Sheba, represented in a similar way to how she appears in a Roman chest in the Hermitage. The carving is executed with detail and quality, emphasising above all the narrative effects. On the side panels, a winged mask holding on its head a vase of flowers, included in a cartouche, is carved in a simpler style and a lager scale. This piece belongs to a fairly numerous group of showpiece chests made from the middle of the 16th century and traditionally considered of Roman provenance, whose style, according to González-Palacios, shows a strong Florentine influence and is closely related with the previously mentioned drawing of the workshop of Perino del Vaga in the Witt Collection. 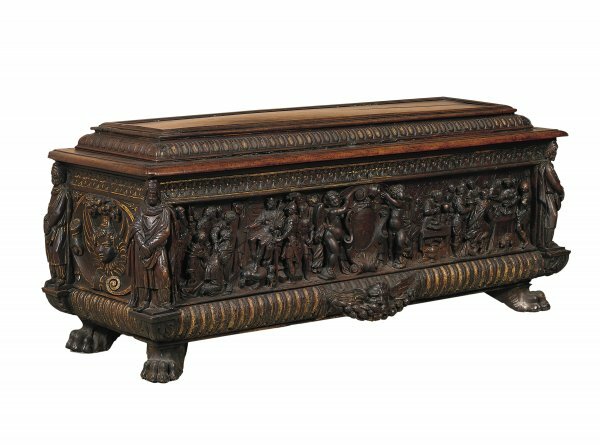 The shape of these Roman chests comes from the various sarcophagi preserved from the latter Roman period, themselves derived from Hellenistic models, in which the surfaces are full of carved human figures. Its antique aspect was usually accentuated by dying or painting brown the walnut wood, which is still visible in many chests, in order to hide the wood veins so that they would not disturb the features of the relieves, and also to imitate in a certain way the aspect of patinated bronze. The style of the carvings, which -as has been said before- wishes to imitate that of antiquity, according to Morley (Furniture. The Western Tradition, London, 1999), was based not only on the ancient stone ornaments and the decoration of grotesques, but was also influenced by Michelangelo's sculpture. Faenson (Cassoni italiani delle collezioni d'Arte dei Musei Sovietici, Leningrad, 1983) also insists on the relationship of Roman chests of the second half of the 16th century with the style of Michelangelo, and asserts that occasionally some designs are attributed to his followers. Although cassoni are usually pieces of furniture of a very homogeneous style, occasionally it is possible to observe certain differences in their composition which may suggest the existence of different workshops dedicated to their production; in this sense, the chest analysed here can be related to a small group made up, among others, of the previously mentioned chest from the Hermitage Museum in St. Petersburg, of another one kept at the Los Angeles County Museum of Art and of a third belonging to the Contini Bonacossi Collection at the Uffizi in Florence.